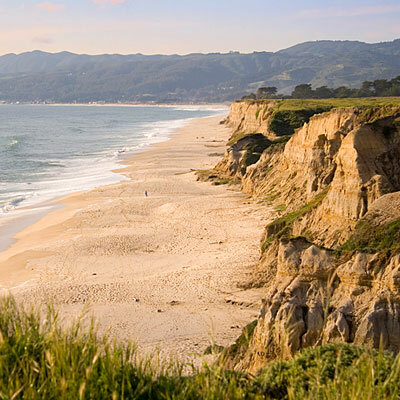 When looking for a great destination, look no farther than Half Moon Bay California. Perched on one of the most beautiful coastlines of California, Half Moon Bay offers a place to take in the vast magnificence of the Pacific Ocean and is serviced by the Half Moon Bay Airport (IATA:HAF, ICAO:KHAF), located just 20 miles south of San Francisco. Venture no further than the local Pillar Point Harbor to catch a glimpse of a variety of marine life, and to purchase fresh fish and crab straight from the boats of the fisherman who use the harbor. Pillar Point is also a great place to catch one of the unique sights of the ocean, the “Jetty “ or “The Breakwater”, a feature consisting of unusual waves formed by currents collision with the man-made break in the harbor. The historic downtown portion of Half Moon Bay has numerous restaurants and shops for visitors to explore. You should also be encouraged to check out the wonderful art galleries located in the downtown area as well. With a flavor all its own, Half Moon Bay, nestled between the soothing sounds of ocean waves and the shadows of lush forested hills, provides the perfect backdrop for any summer getaway. What are you waiting for? Call us today to schedule your next charter flight at (760) 399-1000 or email us at charter@desertjet.com, where a charter specialist will be happy to assist you in arranging all your travel accommodations. Let Desert Jet take you there.